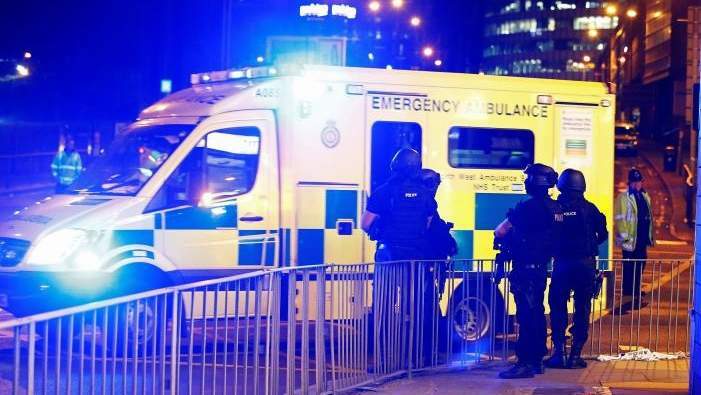 Dubai: The UAE Embassy has advised Emiratis living in Manchester to take caution following the terror attack, which killed 22 people and injured 59 at a pop concert. In a statement issued on Tuesday night, the embassy in London confirmed that all Emiratis across the UK are safe, and warned them to immediately contact UAE authorities for any emergency services. “All Emirati citizens in the city of Manchester are safe and secure. A team from the embassy and its attache offices are following up the developments to ensure that all the UAE’s nationals are safe,” said Sulaiman Al Mazroui, UAE Ambassador to the United Kingdom. Through its official Twitter account, the embassy further advised Emiratis to report any incidents or emergencies on +442075811281. Princess Haya Bint Al Hussein, His Highness Shaikh Mohammad Bin Rashid Al Maktoum, Vice President of the UAE and Ruler of Dubai, also expressed her condolences to the grieving families. On her official Facebook page, Princess Haya wrote in Arabic: “My thoughts and prayers are with the families that have lost loved ones and with the parents that are waiting to hear if their children are safe in Manchester, today. I cannot even begin to imagine how horrific this and so many other similar acts have been, or how utterly desperate and desolate they must feel at this time. On Tuesday, Prime Minister Theresa May deployed soldiers at key sites and warned that Britain is imminently facing another terror attack. May said the national terror threat level was being raised from severe to critical, which means another attack is expected “imminently”. Her statement came after 22-year-old Salman Abedi, reportedly a Briton of Libyan descent, was identified as the perpetrator behind Monday’s deadly attack, whose victims included an eight-year-old girl.